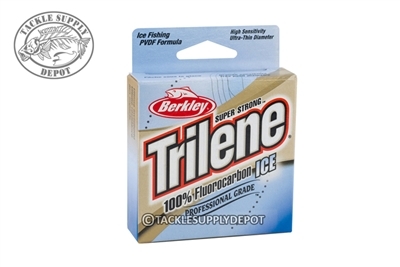 The Berkley Trilene 100% Fluorocarbon Ice Line is designed with a cold weather formula and is processed for high impact strength as well as manageability while ice fishing. As with all fluorocarbon lines, Trilene 100% Fluorocarbon Ice line has a light refraction close to that of water for stealthy presentations and invisibility. The specialized small diameter and lower stretch makes detecting light bites much easier. Whether being used on tip ups or spooled on the reel Trilene 100% Fluorocarbon Ice Line is perfect for the task at hand.